Bone metastasis is one of the most frequent causes of pain in cancer patients. Different radioisotopes such as P-32, Sm-153, Ho-166, Lu-177, and Re-186 with several chemical ligands as ethylenediaminetetramethylene phosphonic acid (EDTMP), 1,4,7,10-tetraazacyclododecane-1,4,7,10-tetramethylene phosphonic acid (DOTMP), and propylenediaminetetramethylene phosphonate (PDTMP) are recommended for bone pain palliation. In this work, 175 Yb-triethylenetetraminehexamethylene phosphonic acid (TTHMP) was produced as a proper alternative to other radiopharmaceuticals. Relatively long half-life (T 1/2 = 4.18 days), maximum energy beta particle Eβ =470 keV (86.5%), low abundance gamma emission 396 keV (6.4%), 286 keV (3.01%), 113.8 keV (1.88%) and low cost are considered advantageous of Yb-175 are to wider usage of this isotope; in addition, TTHMP is an ideal carrier moiety for bone metastases. Production, quality control, and biodistribution studies of 175 Yb-TTHMP were targeted. Yb-175 chloride was obtained by thermal neutron bombardment of a natural Yb 2 O 3 sample at Tehran Research Reactor (TRR), radiolabeling was completed in 1 h by the addition of TTHMP at the room temperature and pH was 7.5-8, radiochemical purity was higher than 95%. 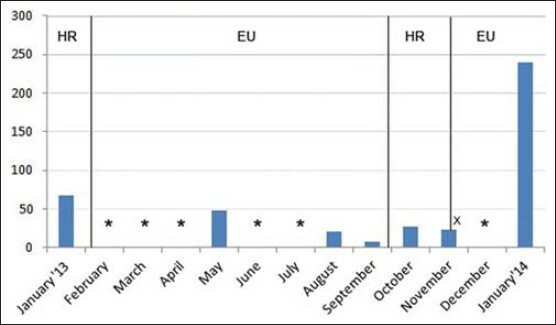 Biodistribution studies in normal rats were carried out. 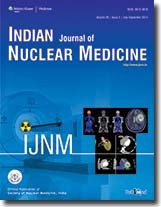 The results showed favorable biodistribution features of 175 Yb-TTHMP, indicating significant accumulation in bone tissues compared with clinically used bone-seeking radiopharmaceuticals. This research presents 175 Yb-TTHMP can be a good candidate for bone pain palliation and substitute of other radiopharmaceuticals, however, further biological studies in other mammals are still needed. Context: Patterns of myocardial fluoro-2-deoxyglucose (FDG) uptake with respect to duration of fasting and dietary modifications. Aim: We observed the effect of duration of fasting and diet on the myocardial uptake pattern of F-18 FDG in patients routinely referred for oncological evaluation and no previous history of Coronary Artery Disease ( CAD). Settings and Design: Prospective study. 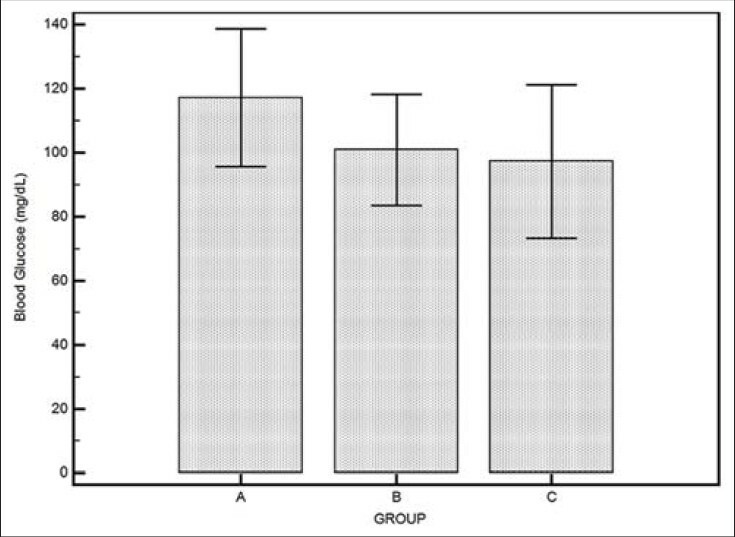 Subjects and Methods: A total of 153 patients (M: 81, F: 72; mean age: 47 ± 15 years; mean blood glucose level (mBG) 105 ± 23 mg/dl) were randomly divided in three groups. Group A: 4-6 h fasting; Group B: Overnight fasting (12-14 h); Group C: Low carbohydrate and fat rich diet for 2 days coupled with overnight fasting prior to the positron emission tomography (PET) scan. FDG uptake was classified as following: 1) homogeneous uptake, 2) heterogeneous uptake, and 3) 'no uptake' in the left ventricular (LV) myocardium. FDG PET study was performed as standard protocol for oncological conditions. Statistical Analysis Used: Descriptive statistics, Chi-square test or Fisher's exact test, and Spearman's rank correlation tests were applied. Results: We observed the 'no uptake' pattern in five (10%), 28 (55%), and 39 (77%), 'heterogeneous' pattern in 20 (39%), 14 (28%), and seven (14%), and 'homogeneous' pattern in 26 (51%), nine (18%), and five (10%) patients in Group A, B, and C, respectively. There was statistically significant difference of myocardial uptake pattern between group A and B (P < 0.0001), between group A and C (P < 0.0001), and between Group B and C (P = 0.023). The mBG was 102, 105, and 111 mg/dl in 'no uptake', heterogeneous, and homogeneous uptake pattern, respectively, (P = 0.103). Also, within each group the mBG was not related to the uptake pattern. Conclusion: Both restricted diet and duration of fasting play an important role in determining the pattern and suppression of myocardial F-18 FDG uptake. Overnight fasting and restricted diet together suppress myocardial FDG uptake more than overnight fasting alone, which suppresses uptake more than 4-h fasting. Background: Many radio-pharmaceuticals have been used over the years to localize the recurrences in patients with medullary carcinoma thyroid (MCT), including iodine-131-metaiodobenzylguanidine, thallium-201, technitium-99m dimercaptosuccinyl acid [Tc-99m DMSA (V)], Tc-99m methoxyisobutylisonitril, Tc-99 ethylenediamine diacetic acid/hydrazinonicotinyl-Tyr (3)-octreotide, and In-111 diethylenetriaminepenta-acetic acid-octreotide with varying sensitivities and specificities. Aims: The aim of this study is to explore the role of Tc-99m DMSA (V) scan in MCT patients with postoperative persistent hypercalcitoninemia in the positron emission tomography-computerized tomography (PET-CT) era. Materials and Methods: A retrospective review of 53 patients with proven sporadic MCT, who presented to our institution over a period 28 years from 1985 to 2012, was performed. Patients with persistently elevated levels of serum calcitonin (>150 pg/ml) were initially evaluated by a DMSA scan if conventional imaging failed to localize any focus of disease. Results and Conclusions: Our study showed that the postoperative levels of serum calcitonin significantly correlated with the overall survival of our patients and can possibly serve as a good prognostic marker. Tc-99m DMSA (V) scans demonstrated a sensitivity of 75%, specificity of 56%, a positive predictive value of 50%, and a negative predictive value of 80% in detecting metastasis in postoperative persistent hypercalcitoninemia. Our study showed that Tc-99m DMSA (V) scanning is an affordable and a reasonably sensitive imaging agent for localization of recurrent/metastatic disease. 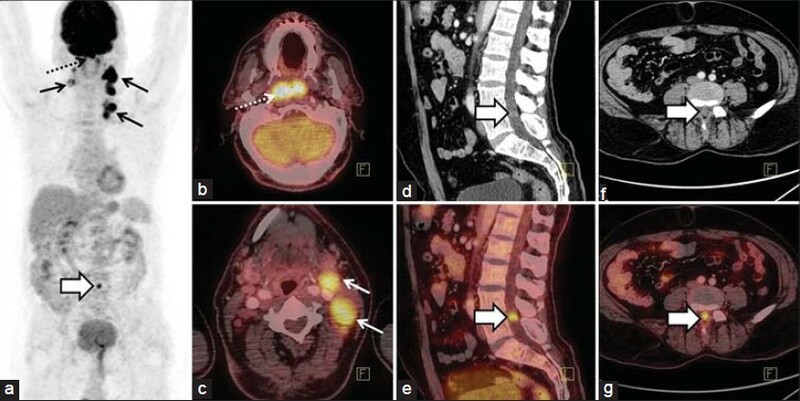 PET-CT seems to be a useful complementary tool and needs to be kept in the armamentarium for diagnosis of recurrence especially in cases of discordance between Tc-99m DMSA (V) scan and the serum calcitonin levels. Majority of patients with head and neck cancer are treated with combined treatment regimes such as surgery, radiation therapy, and chemotherapy. 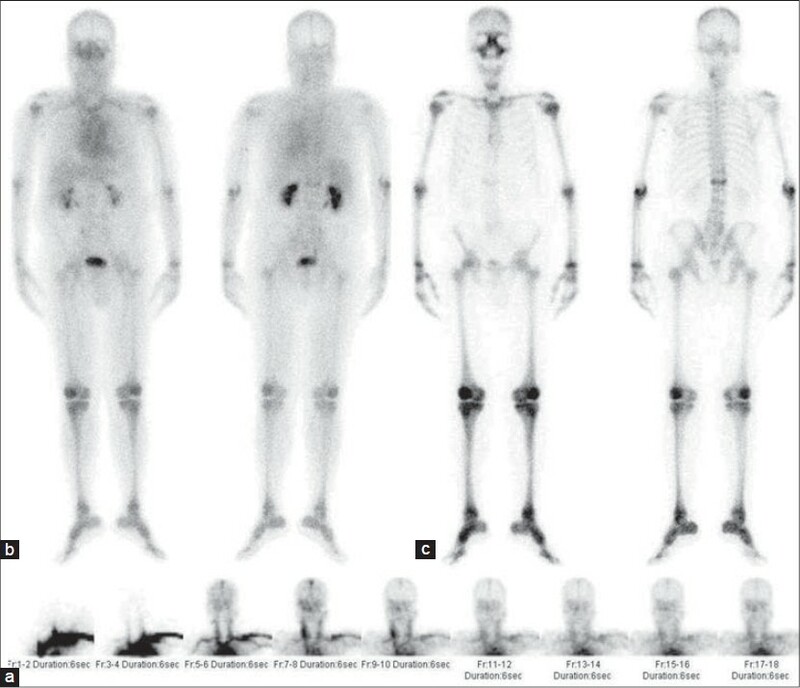 The loss of structural symmetry and imaging landmarks as a result of therapy makes post-treatment imaging a daunting task on conventional modalities like computed tomography (CT) scan and magnetic resonance imaging (MRI) as well as on 18 Fluorine-Fluorodeoxyglucose Positron Emission Tomography/Computed Tomography (18F FDG PET/CT). 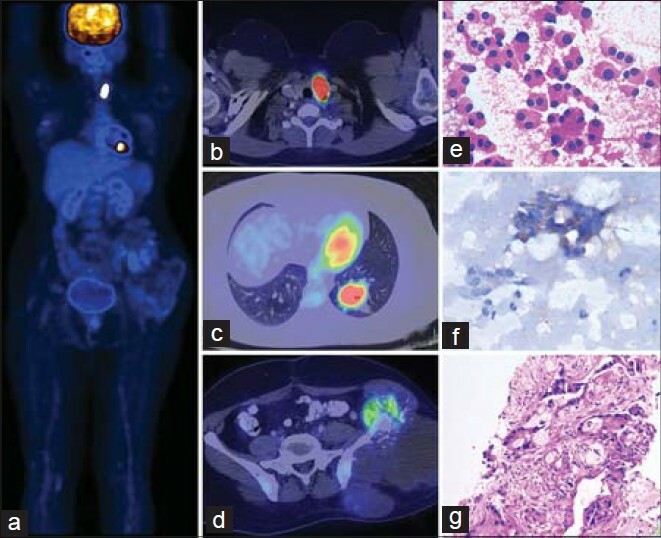 Combined multimodality treatment approach causes various tissue changes that give rise to a spectrum of findings on FDG PET/CT imaging, which are depicted in this atlas along with a few commonly encountered imaging pitfalls. The incremental value of FDG PET/CT in detecting locoregional recurrences in the neck as well as distant failures has also been demonstrated. Bone scintigraphy in which there is excessive skeletal radioisotope uptake in relation to soft tissues along with absent or faint activity in the genitourinary tract is known as a 'superscan'. Prostate cancer is the most common malignancy associated with superscan along with others such as lung cancer, breast cancer and haematological malignancies. Here we present the case of a 41 year old woman with carcinoma colon with metastatic superscan on 99m Tc-MDP bone scintigraphy, a very rare cause for metastatic superscan. Tc-99m DMSA and Tc-99m EC studies are invaluable functional imaging modalities for renal structural and functional assessment. Normally, the relative renal function estimated by the two methods correlates well with each other. We here present two patients with renal tubular acidosis who showed impaired/altered DMSA uptake with normal EC renal dynamic study depicting the pitfall of DMSA imaging in tubular disorders. The two presented cases also depict distinct pattern of Tc-99m DMSA scintigraphic findings in patients with proximal and distal renal tubular acidosis, thus highlighting the factors affecting DMSA kinetics. Non-ossifying fibromas (NOFs) are benign bone lesions with variable appearance on bone scintigraphy. Single photon emission tomography/computed tomography (SPECT/CT) can help in accurate characterization of these lesions. We present a case of 14-year-old boy with recurrent osteosarcoma where NOF was mimicking distant metastasis on 99m Tc-methylene diphosphonate bone scintigraphy. SPECT/CT was able to correctly characterize the lesion as NOF, thereby altering the management. Erdheim-Chester disease (ECD) is a rare systemic non-Langerhans cell histiocytosis. It is a progressive disease of unknown etiology. The 99m technetium-methylene diphosphonate ( 99m Tc-MDP) bone scan is useful in finding the sites of involvement in the skeleton and is helpful in excluding other causes of bony pain. 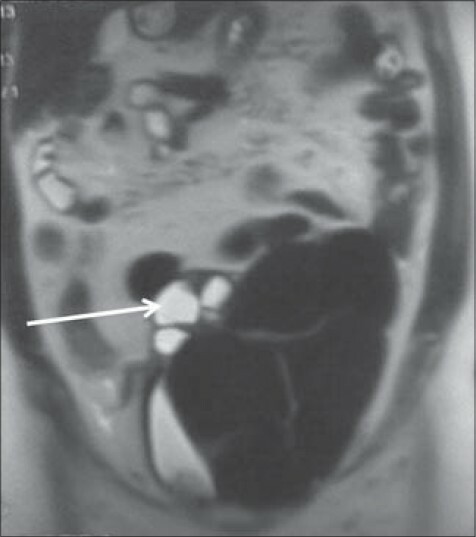 Also a scintigraphic pattern consistent with ECD should alert the physician to evaluate the patient for visceral sites of involvement using fludeoxyglucose positron emission tomography/computed tomography (FDG PET/CT), as this is known to be fatal at times. Pulmonary sclerosing hemangioma (PSH), or the alternative name of "sclerosing pneumocytoma," is a rare benign neoplasm. PSH is often asymptomatic and presents as a solitary or multiple pulmonary nodules on radiologic imaging studies. 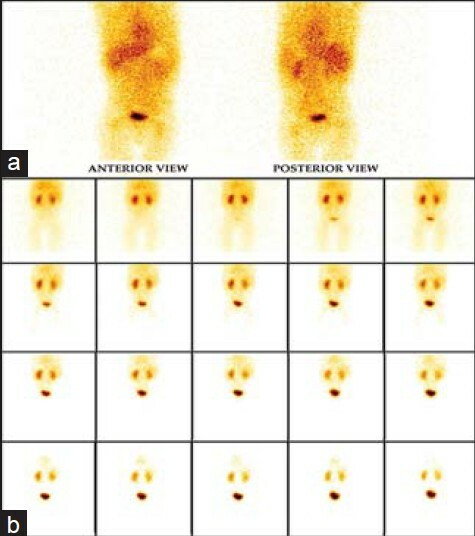 Few articles have been reported to describe the fluorodeoxyglucose positron emission tomography (FDG PET) findings about PSH. 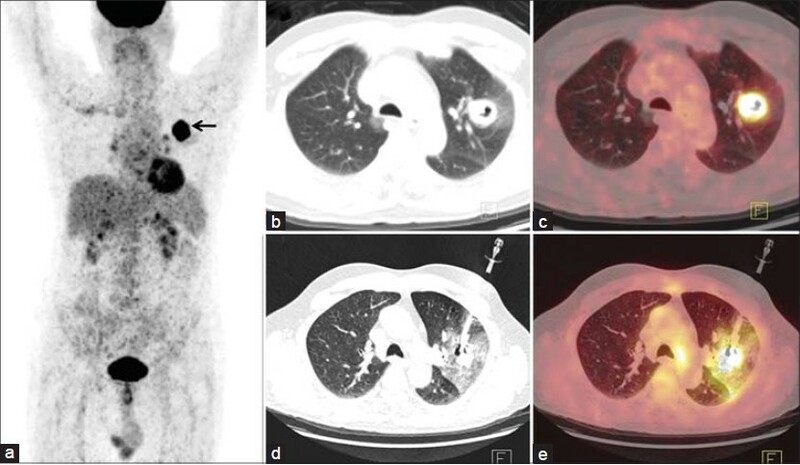 The authors describe an interesting but uncommonly encountered cause of false positive FDG PET scan in the thorax in a 25-year-old woman, a known case of arteriovenous malformation of oral cavity who underwent embolization and presented with incidental detection of bilateral lung nodules. She is asymptomatic and is on follow-up. 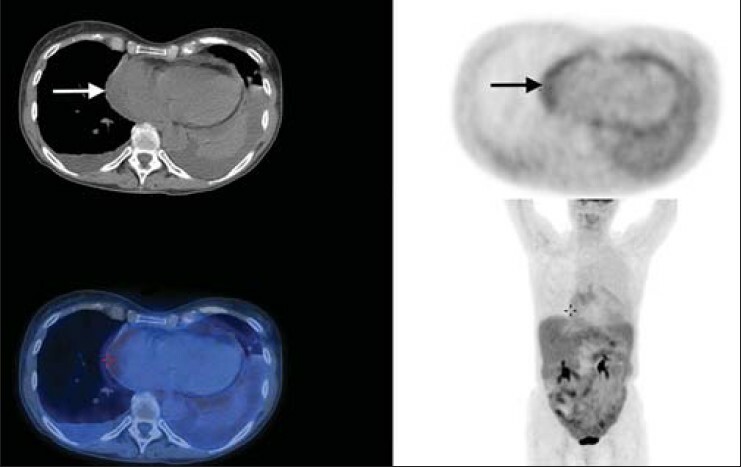 A 37-year-old male who underwent a central hepatectomy of the liver for hepatocellular carcinoma (HCC) was referred for an 18 F-fluorodeoxyglucose positron emission tomography/computed tomography ( 18 F-FDG PET/CT) study to rule out tumor recurrence or metastases. The scan showed a recurrent hepatic mass at the operative site, along with low-grade uptake in bilateral pulmonary metastases, mediastinal and hilar lymph nodes, and few skeletal sites. A non-FDG avid intracranial extradural mass was visualized in the right frontal lobe. 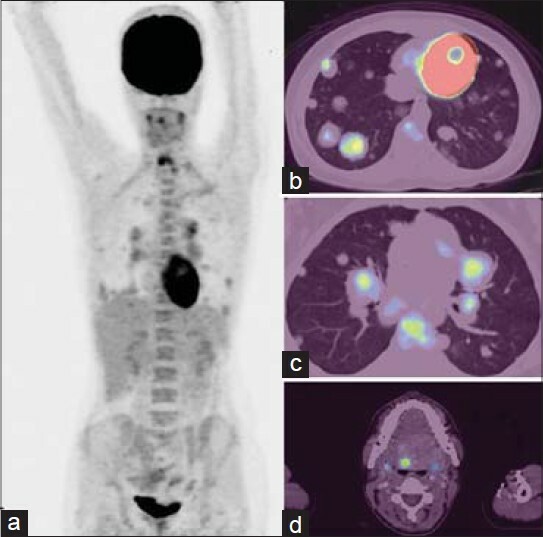 The 11 C-methionine PET/CT scan performed subsequently revealed a larger area of involvement at the primary site, along with widespread metastases to the lungs, mediastinal, hilar, and abdominal lymph nodes, and multiple skeletal sites. Further, dural metastasis with high tracer uptake was noted in the frontal region. 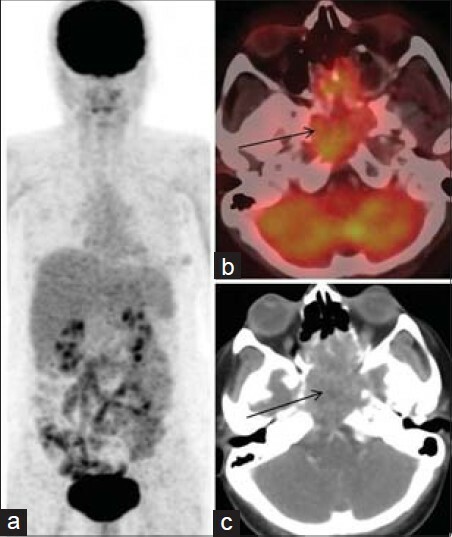 To the best of our knowledge, this is the first case documented in the literature, wherein 11 C-methionine PET/CT played a significant role in delineating the widespread dissemination, including the extremely rare dural involvement in a case of HCC. This report highlights the potential value of 11 C-methionine PET/CT in assessing the hepatic and extrahepatic tumor burden in cases of HCC, especially in clinically unexpected locations. Gallium-68 (Ga-68) DOTA-peptide positron emission tomography/computer tomography (PET/CT) has higher sensitivity and improved spatial resolution for the detection of somatostatin receptor expressing tumors than conventional somatostatin receptor scintigraphy. We present the findings of Ga-68 DOTATATE PET/CT in a rare case of primary neuroblastoma of the neck in a 12-year-old female child and its role in the evaluation of the treatment response. The central nervous system metastasis from nasopharyngeal carcinoma (NPC) is an extremely rare occurrence, although direct intracranial invasion is not infrequent in patients with NPC. 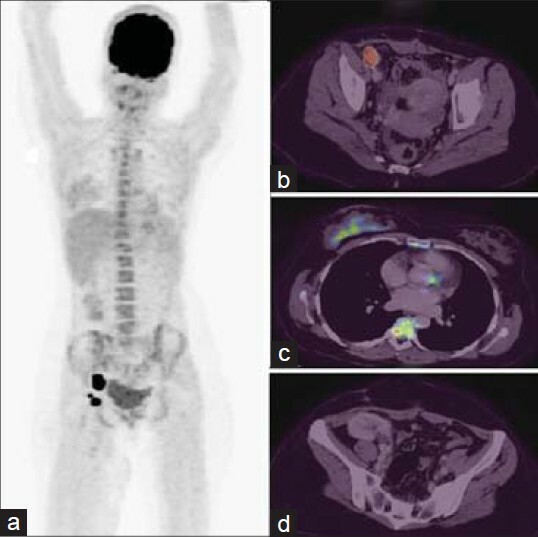 Herein we report a case of a 62-year-old male with NPC, in whom the asymptomatic cauda equina metastasis was detected on staging 18 F-Fluordeoxyglucose positron emission tomography-computed tomography (F-FDG PET/CT). 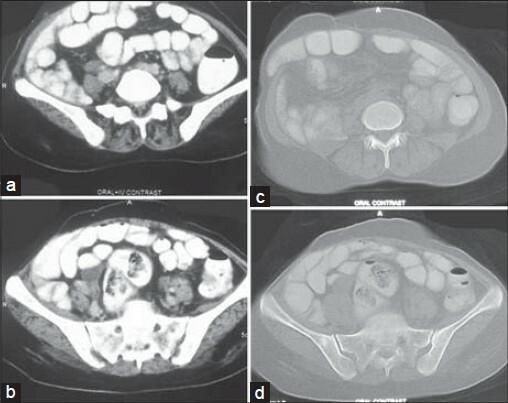 By demonstrating distant metastasis to cauda equina, 18 F-FDG PET/CT detection helped in change of management in this patient. 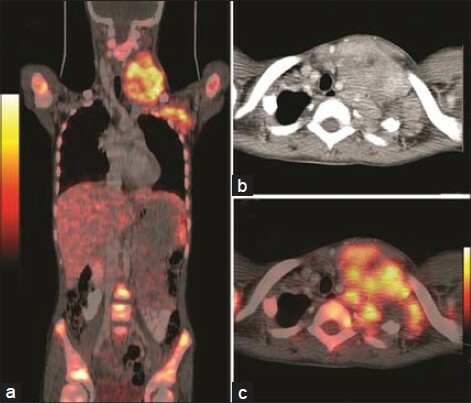 The authors report a very unusual occurrence of a massive recurrence of leiomyoma from post hysterectomy stump diagnosed on fluorine-18 fluorodeoxyglucose positron emission tomography/computed tomography (F-18-FDG PET/CT). The case also has an additional complexity of granulosa cell tumor (GCT) of ovary probably contributing to the recurrence and massive size. We present a 71-year-old female with human herpes virus 8 (HHV8)-unrelated primary effusion lymphoma (PEL)-like lymphoma. Dyspnea and pericardial effusion led to pericardiocentesis, diagnosing diffuse large B-cell lymphoma. 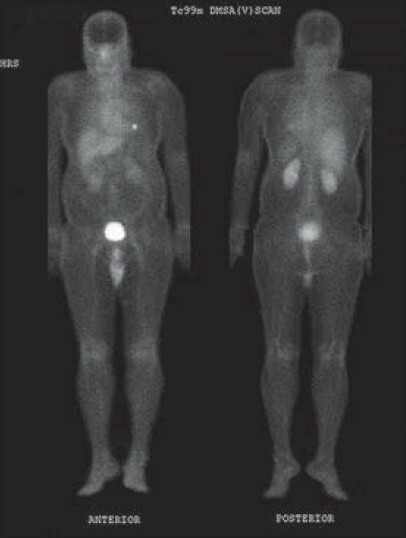 She underwent positron emission tomography/computed tomography ( PET/CT), which demonstrated hypermetabolic pericardial, pleural, and ascites fluid without lymphadenopathy elsewhere. Malignant fluid in the absence of lymphadenopathy is a hallmark of PEL. PEL is associated with immunodeficiency states such as acquired immunodeficiency syndrome (AIDS) and infectious agents such as HHV8. Our patient had no such history and had not received immunosuppressive chemotherapy. 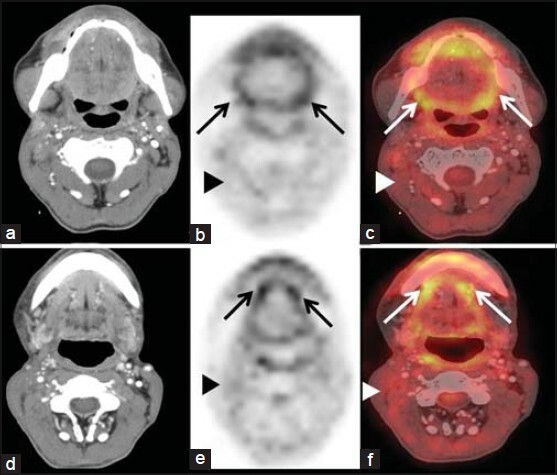 We present the PET/CT findings of this rare case of HHV8-unrelated PEL-like lymphoma. Multifocal osteosarcoma is diagnosed when there are two or more lesions in the skeleton without presence of pulmonary metastases. 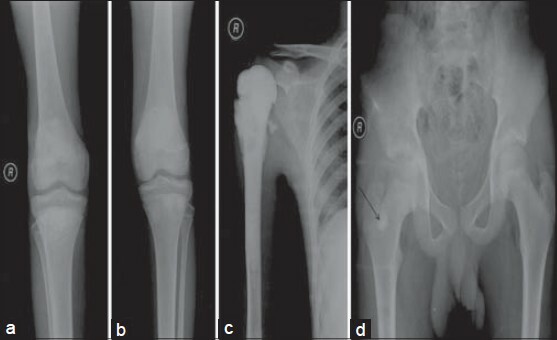 It is further classified as synchronous type when the patient is demonstrated to have more than one lesion simultaneously at presentation and is known as Synchronous Multifocal Osteogenicsarcoma (MOGS). We report a case of synchronous MOGS showing its multimodality imaging findings including nuclear scan findings with pathological correlation. Post-transplant lymphoproliferative disorder (PTLD) is a heterogeneous group of lymphoid proliferations caused by immunosuppression after solid organ or bone marrow transplantation. PTLD is categorized by early lesion, polymorphic PTLD and monomorphic PTLD. 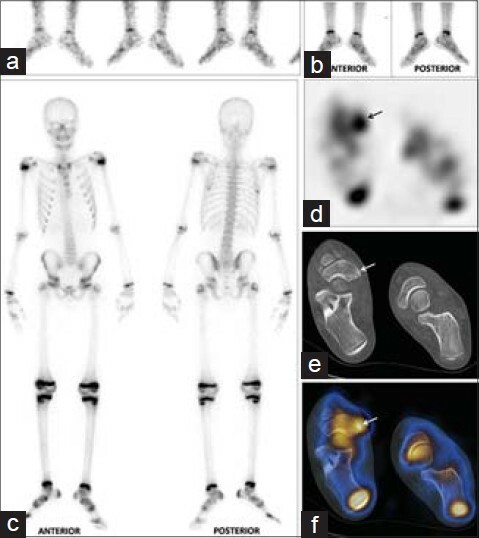 Fluorine-18 fluorodeoxyglucose-positron emission tomography/computed tomography (F-18 FDG-PET/CT) scans have clinical significance in the evaluation of PTLD following renal transplantation. We report imaging findings of a monomorphic non-Hodgkin lymphoma, post renal transplant seen on FDG PET/CT in a 32-year-old lactating woman. Whole body FDG- ET/CT demonstrated uptake in right external iliac and inguinal lymph nodes. Accessory navicular bone is one of the supernumerary ossicles in the foot. Radiography is non diagnostic in symptomatic cases. Accessory navicular has been reported as a cause of foot pain and is usually associated with flat foot. Increased radio tracer uptake on bone scan is found to be more sensitive. We report a case highlighting the significance of single photon emission tomography/computed tomography in methylene diphosphonate bone scan in the evaluation of symptomatic accessory navicular bone where three phase bone scan is equivocal. Increase in glycolytic pathway, forms one of the major adaptations in various cancer types. This can be imaged using 18 F-fluoro-deoxyglucose positron emission tomography/computed tomography (FDG PET). The intensity of FDG avidity is an indirect marker of the grade of the tumor. 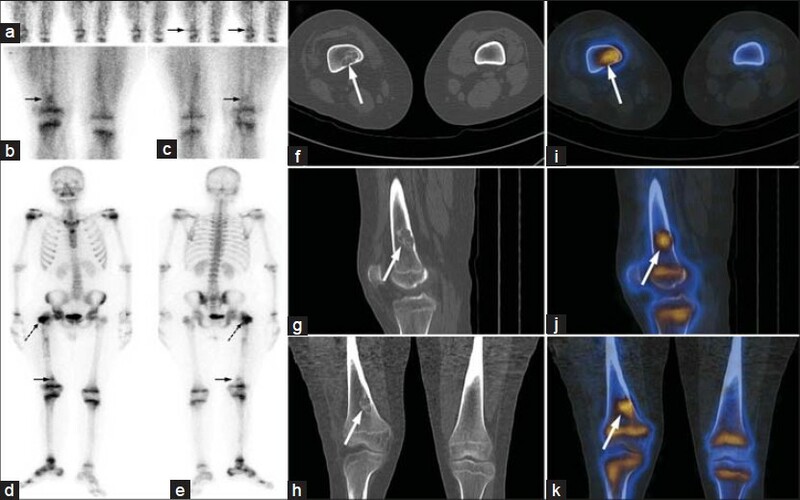 We present a case where FDG PET demonstrated a known chondrosarcoma and two other incidental lesions. The intensity of avidity in each of the lesions was grossly incongruent from the chondrosarcoma and further investigation proved the lesions to be two distinct primary malignancies, pathologically different from the known chondrosarcoma. We present the case to highlight the fact that the grade of FDG avidity is a clue to the pathological nature of the lesion and should always be considered while interpreting PET images.